Whether it meant to or not, The Los Angeles Times had a pretty amazing headline Thursday calling out John Travolta's recent Oscar goof. 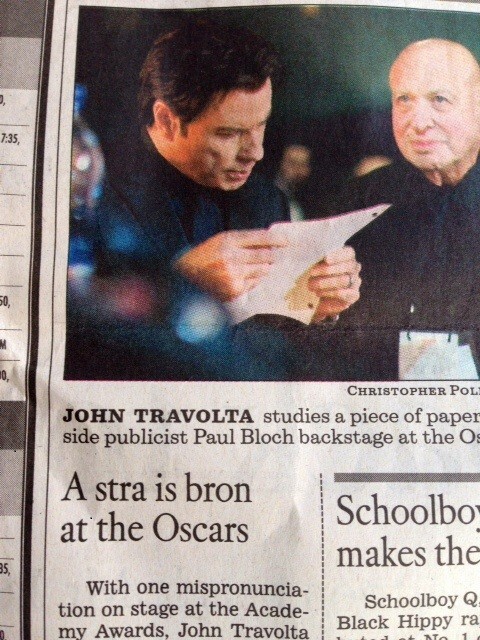 The headline, "A stra is bron at the Oscars" appeared above a story about when the actor butchered singer Idina Menzel's name at the Academy Awards. While it's not confirmed if this misspelling is just a typo or a riff on the actor's own mispronunciation, it's definitely a headline worth pointing out. Todd was caught <a href="https://www.huffpost.com/entry/chuck-todd-flips-bird-finger-morning-joe_n_1147971" target="_hplink">giving someone the middle finger</a> on "Morning Joe" when he thought the camera was not on him.